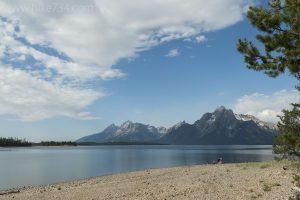 This walk explores a peninsula that juts out into Jackson Lake. The trail consists of two loops that are connected by a land bridge, forming a figure eight. Hiking it clockwise from the south shorelines to the north shorelines has you initially following a dirt road with filtered views of the marina through the trees. The trail becomes a single track trail as it heads into the trees with a brief view of Colter Bay. The land bridge offers a nice view looking north to Jackson Lake. At the end of the land bridge, stay left as you enter the forest and begin to climb a little bit. This section is a forested walk with no real views of the lake until you get to the far southwest end of the peninsula. Once there, the views are great looking out to Elk Island and towards the beautiful Tetons. Heading north, the trail roughly follows the shoreline. It then ducks back into the trees and goes up and over a small rise, then down to the north shoreline. Here you look north and northeast to the Colter Bay picnic area. The trail enters the trees with scant views of the lake until you return to the land bridge. Once across, stay left at the junction. The trail stays true to the shoreline with wonderful views until it begins turning south and into the woods. Take a right at the trail junction to head towards the amphitheater and the Colter Bay Visitor Center where you started. Trailhead: Head north on the paved path behind the Colter Bay Visitor Center. Follow it around the bay of the marina to the trailhead sign.